Human Rights Watch asks President Bolsonaro to adopt measures that both enhance respect for human rights and reduce crime. RIO DE JANEIRO, BRAZIL – In 2017 Brazil set a record; one that most countries would rather not have: of violent deaths. According data from Human Rights Watch (HRW) South America’s largest country registered 63,880 cases of violent deaths and last year’s final numbers (not yet released) are expected to be just as worrisome. Residents of favelas in Rio de Janeiro protest against violence in Copacabana Beach, photo internet reproduction. “President Jair Bolsonaro should address the public security crisis that engulfs Brazil through measures that both enhance respect for human rights and reduce crime,” suggested HRW’s World Report 2019. “Brazilians are understandably fed up with the very high crime rate in the country,” said Jose Miguel Vivanco, director of the Americas division at Human Rights Watch. 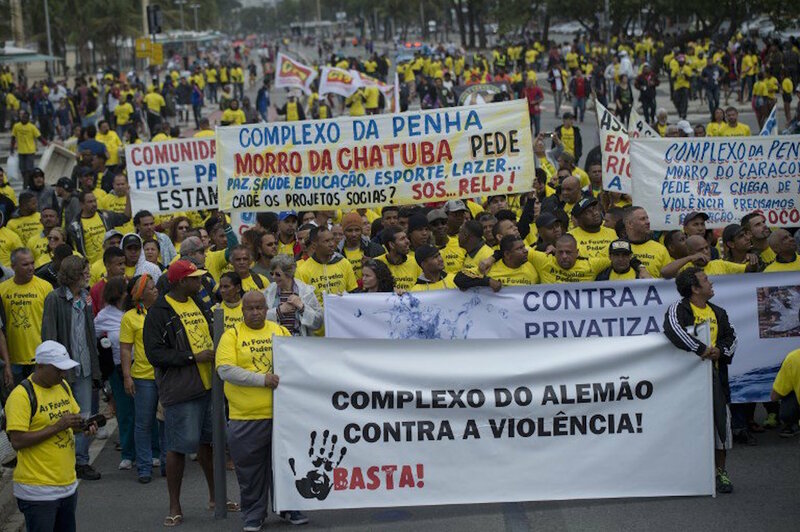 “But encouraging police to kill and packing more suspects who haven’t yet been tried into Brazil’s overcrowded prisons will undermine, not enhance, public safety,” added the executive. According to the entity during 2017, deaths committed by in-service and off-duty police increased by twenty percent compared to 2016. The document analyzed human rights’ situations in more than ninety countries. Vivanco met this week with members of the Bolsonaro administration to discuss human rights concerns in Brazil, including Justice Minister Sérgio Moro, Government Affairs Minister, General Carlos Alberto dos Santos Cruz, and Human Rights Minister, Damares Alves. Recent measures by Bolsonaro, such as easing firearm sale rules, have been criticized by human rights groups across the world. “Instead of pursuing policies that violate human rights, the Bolsonaro government should embrace reforms that are consistent with Brazil’s obligations under international law and will ultimately be more effective at reducing crime,” the HRW report said. Most deaths by guns in the USA are in the family, at home. They do not make it safer, but rather more dangerous. Brazil already has a system where that those that prove they need a gun can get one. Allowing everyone to have a gun will make us envious of the current death by violent crime rate. Douglas Trent, you haven’t a clue as to what you speak. According to the FBI’s own statistics you are just wrong.